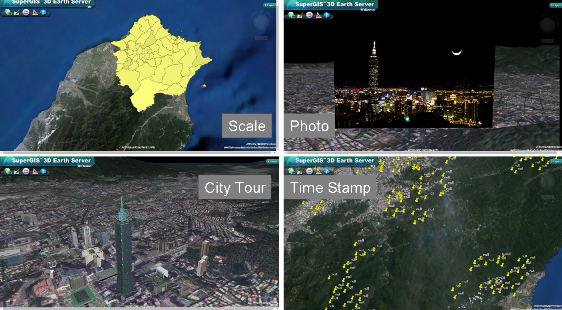 SuperGIS 3D Earth Server 3.2 can help GIS developers to build a 3D GIS display platform, which contains some general information or topical information. Everyone can go to that 3D GIS platform to search for information they want. In addition, they can also upload their GIS data in kml/kmz format onto that platform to see them in a 3D space. The kml is a file format developed by Google, which is used to display geographical phenomenon. Users can use the kml to show points, lines, polygons, photos, and so on. SuperGIS 3D Earth Server supports most of the kml data. This article will show you some of the applications of displaying kml data in SuperGIS 3D Earth Server. Scale has always been an important issue to geographers. Even the same geographic event can show different geographical patterns under different scales. For example, the distribution of a disease may be non-clustered under county level but be clustered under the city level. Therefore, it is important to show different level of detail when zooming in and out the map. With the kml file, developers can design such a data to show different information under different scales, and allows users to see even more geographical phenomenon in a kml file. In the map website (http://sgs.supergeo.com.tw/SeaLevel/scale.htm), you can see a disease distribution under city level. The distribution seems like to be a random one. If the decision-makers only see the data under this level, they can not target any hotspots to deliver the resources such as medicine and doctors. But if you zoom into the map, you will see the distribution under individual level. And the distribution becomes obviously clustered. In this way, the decision-makers can find the hotspots and distribute the limited resources efficiently. In addition to the tradition vector and raster data, kml files can also display photos in a 3D space. The photo can ‘stand’ on the ground rather than lie on the ground like they always do in other traditional GIS platforms. In this way, you can display your photos in a realistic view, making the photo come to life again. In the 3D map website (http://sgs.supergeo.com.tw/SeaLevel/photo.htm), you can see a photo standing on the ground where the photo is taken. By viewing photo in this way, you are able to better recognize the relative locations of each building and feature in the photo. The kml tour can guide the users through a designed route, showing them different views at different locations in a sequence. If you are in the tourism business, you can use it to show your clients the tour route and the sights on the way, giving them a clear sense about where they are going to and what they are going to see in this tour. Geographers now want to see not only the space dimension of the data, but also the time dimension. For example, geographers want to know not only where the diseases distribute in the geographical space, but also how they spread through space and time. The time dimension of the data enables the geographers to better understand the diseases and even make predictions on where the disease will spread in the future. In the map website (http://sgs.supergeo.com.tw/SeaLevel/time.htm), you can click the play button on the lower left to see how the geographical phenomenon spread through space and time. The kml file is a convenient tool for geographers to display vivid geographical phenomenon in a GIS platform. You can use it to display different level of information under different scales, or show the time dimension of the data. It is very useful to show different geographical phenomenon, and you would like to share those information with other rather than keep them in your own computer. With SuperGIS 3D Earth Server 3.2, GIS developers are able to create a web GIS platform and share the kml file to the world.